It’s a challenge cooking for kids on a good day, we try to make the tastiest and most nourishing meals we can. While we don’t have our own children we are quite close to our niece and nephew. We love to have them for sleepovers and try to cook at least one homemade meal for each stay. They appreciate the home cooked meals and show a lot of enthusiasm by asking what we can make next. We enjoy the time we spend together preparing, cooking and ultimately eating our creations. 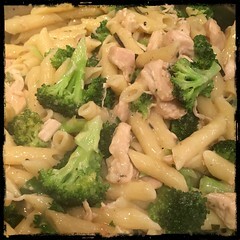 This particular recipe is dedicated to our nephew Zachary, who loves broccoli, chicken and of course, pasta! 1. Marinate the chicken for about 30 minutes. Remove chicken from marinade (save the liquid), let drain and coat with flour, salt, pepper and fresh cut rosemary. 2. In a medium sized dutch oven or sauce pan, sauté the garlic in 2-3 tbsp of olive oil. 3. Once the garlic ‘begins’ to soften add the seasoned chicken and 1-2 tbsp of unsalted butter. 4. As the chicken cooks add the reserved liquid from the marinade and allow the sauce to come to a simmer. 5. Add the cup of white wine and let it return to a simmer. 6. Once simmering, toss in a couple of bay leaves. 7. While the sauce is cooking you can begin boiling the pasta and steaming the broccoli. 8. When broccoli is steamed to your liking (keep it slightly crispy) toss with some lemon juice and a touch of olive oil. 9. When the pasta is cooked (al dente), drain water and toss it together with the the chicken sauce. 10. Finally, fold in the broccoli and fresh cut flat-leaf parsley. 11. Serve with a bit of grated Pecorino Romano cheese.